Alternative bridge options cost a fraction of CRC | Audio and video stories from Southwest Washington. The Columbia River Crossing Light Rail project carries a $10 billion* price tag. To date, how the project will be funded has not been ascertained and is referred to as a “debt bomb” by Chris Girard in his preface to the Cortright Report. Despite the heavy price tag, the CRC project falls short of fixing other known transportation issues, such as the bottlenecks at the Rose Quarter and the Terwilliger Curves on the Oregon side of the river, and congestion restrained by limiting the river crossings to only two. Comparing three other bridge projects in the United States to the CRC Light Rail project demonstrates what has been done and what could be done, all at far lower taxpayer expense. In January 2005, construction began on the Hoover Dam bypass project, a 2,000-foot long bridge spanning the Black Canyon in Arizona positioned 890 feet above the Colorado River. It was completed almost six years later in the fall of 2010. It is also called the Mike O’Callaghan – Pat Tillman Memorial Bridge. It connects the highways of Arizona and Nevada, and addressed congestion issues presented by switchbacks leading up to Hoover Dam and other restrictions of the area. The overall Arizona project included five miles of new freeway and numerous bridges along rough cut and fill terrain at a price tag of $240 million, less than 10 percent the cost of the Columbia River Light Rail project (CRC). Specifically, the cost of the bridge portion was even less, only $114 million. In 1977 construction began on the Glenn L. Jackson Memorial Bridge, an 11,750-foot span, also known as the I-205 bridge. At only 144 feet above the Columbia River, it stands much closer to the water than the bridge in Arizona. Cost of the bridge hit $169 million, with the federal government providing $155.7 million, Washington $4 million and Oregon $9.9 million. In 1982, the I-205 bridge was officially opened. Columbian archives state that the bridge was expected to carry 27,000 cars a day, 20,000 siphoned from I-5 which now carries 130,000 vehicles a day. The Columbian archive shows a higher price tag, $175 million, which is still less than 2 percent of the cost of the CRC. The 192nd area is a hotbed of development. In a Feb. 7, 2010 Columbian article on the rapid expansion of east Clark County, the 192nd area was dubbed the “Gateway to east Vancouver or the Entrance to west Camas.” The purpose of the proposed crossing at 192nd Avenue is to relieve congestion on the Glenn Jackson Bridge and provide a shorter distance for many East County commuters. It is championed by citizens who want to encourage discussion of third, fourth and fifth bridges between the two states. The 192nd Ave. bridge is estimated to cost $400 million, with recommendations to save the money first, then build, thus saving the exorbitant cost to finance. Its price tag is 5 percent of the cost of the current projections of the Columbia River Crossing. The above video presents a visual perspective of the price of each of these completed bridge projects and the proposed crossing at 192nd Ave. The video uses a rough estimate of one foot per $100 million, and sends an unmanned aerial system to hover in the air at spatial touch points that represent the value each. Next week COUV.COM will have citizen video from the Hoover Bypass project showing the project’s multiple bridges. 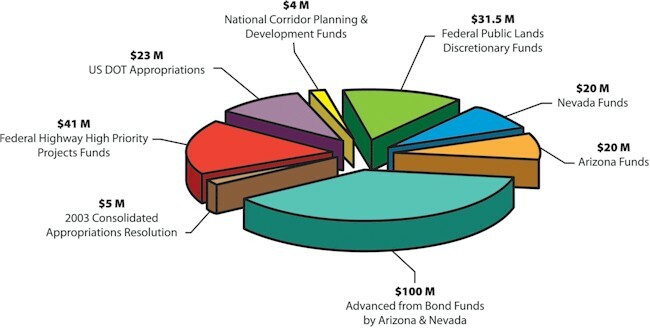 Funding pie of Hoover Dam Bypass Project (image). Wiki info Hoover Dam Bypass Project. A Google search on the 192 Ave Bridge.